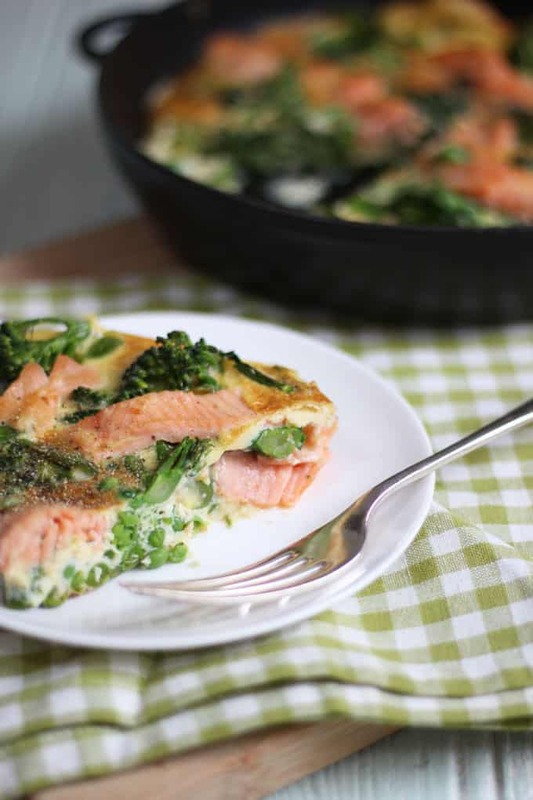 This easy smoked salmon and broccoli frittata recipe (with peas for extra veg too) has been a life saver for me in recent months. 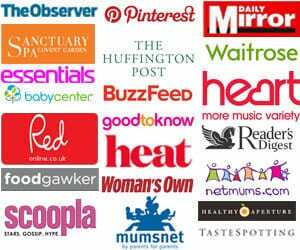 If you follow me on YouTube you’ll know I’ve been dabbling with Slimming World and the The Body Coach, Lean in 15 plan to try and lose a lingering few pounds. Honestly? I don’t seem to have had a great deal of success sticking to either ‘plan’ so I’m thinking about shifting my focus a bit to be more mindful and conscious of what I’m eating, rather than being too rigid. This means trying to make sure I have a good balance of protein and vegetables in every meal. I know I feel so much better when I eat like that.. So why is it so hard to do it consistently? A lack of time and planning often I guess. 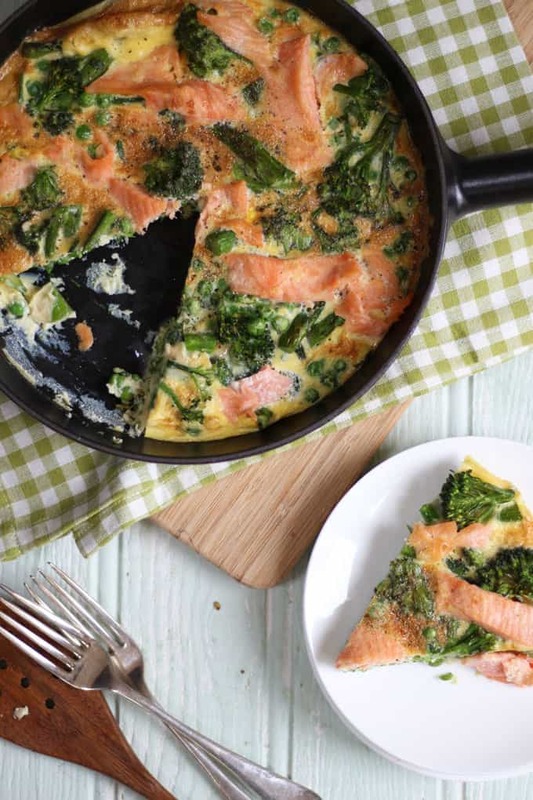 Step in miracle breakfast frittata recipe – hurrah! This easy frittata, Spanish omelette, crustless quiche, whatever you’d like to call it, is so versatile and tasty. I’ve been making it for family dinner and then having leftovers for breakfast. The Norwegian Smoked Salmon gives it a real depth of flavour that makes it taste like a lot more work that it actually is. This is also a great way of getting green veg into your diet in the morning without even realising. 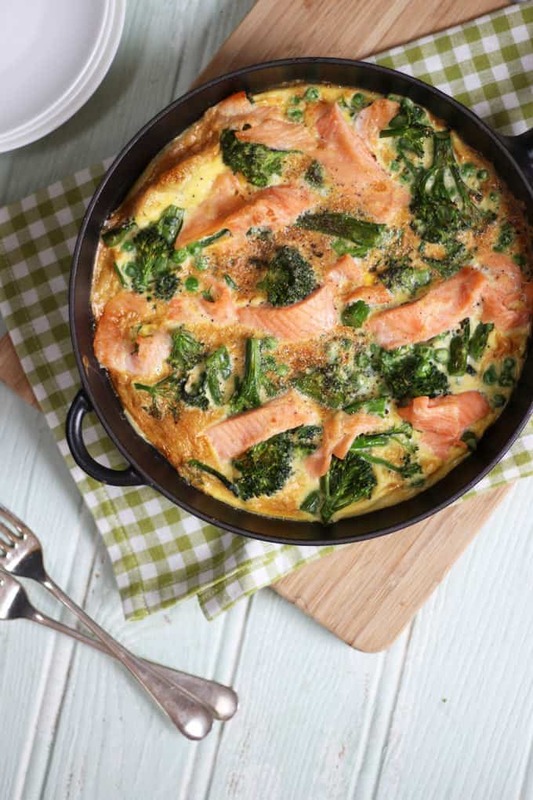 This smoked salmon and broccoli frittata fits in perfectly with the Slimming World diet and the Lean in 15, Joe Wicks plan if you’re following either of those. What’s your favourite easy balanced meal? Any other ideas for protein filled breakfasts for me please? Don’t overcook the salmon, cook until it’s just turned a solid pale pink throughout. This would make a brilliant packed lunch, just chill and wrap up. 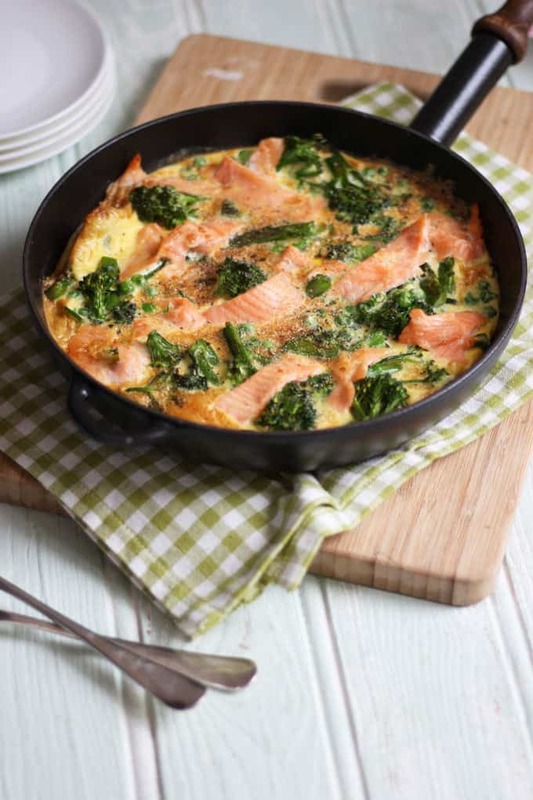 I used to make this with normal (unsmoked) cooked salmon for my children when we were doing baby led weaning, and cut it up into fingers for them. They loved it! Mix and match and add whatever vegetables you have available. Add the broccoli and fry for 5 minutes until softened. Add the peas and fry for a further 3 or 4 minutes until warmed through. Add the strips of salmon, the beaten egg and salt and pepper. Cook through until the base is just set. Pop under a hot grill to finish off. 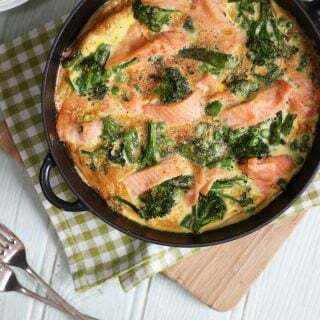 Looks delish and very healthy, adding to my regular recipes as greàt for breaky, lunch or dinner!! Easy peasy! Can this be baked ? I changed the recipe in that I used cauliflower (375 grams instead of the combined broccoli and peas) and used 200 grams of baked salmon. I put in dill as well. I baked it in a shallow dish for about 25 minutes at 350F. LOVED this! Make it for lunch with a girlfriend and served it with spinach, dill, snap pea and red bell pepper salad with balsamic vinaigrette. Toast with basil pesto on the side (there’s an insane amount of basil in the garden). I will be making it again and again. Thanks for the delicious recipe.